Today is Easter Sunday, which falls this year as double header with April Fools Day. So when L asks if I intend taking her to see Mary Magdalene, I at first think she’s joking. Then again, I suppose as it's Easter lets have a spot of Jesus. Unfortunately the film isn’t on locally, so we head over to the Phoenix Arts Centre in Leicester. It’s always nice to visit a new cinema and we take the train over because surprisingly there is a half decent service running on Easter Sunday. 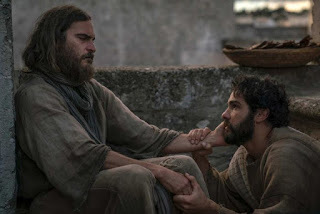 ‘Mary Magdalene’ is yet another retelling of the Jesus Christ story but this time using a new interpretation of the New Testament which does a demolition job on the wildly held assumption that Mary Magdalene was a mere prostitute. As an RE lesson, pretty much all the usual story is present and roughly correct. You know, the raising of Lazarus, Palm Sunday, the Last Supper, Judas’s betrayal and the Crucifixion. This time though Mary Magdalene seems to be Jesus’s right hand man, I mean woman, rather than Peter. Mary M (Rooney Mara) rejects the expected norms of an arranged marriage and a future of prodigious childbearing for the want of something better to do with her life. Good girl. Her family are rather appalled at this ground breaking madness and promptly attempt to exorcise the demon within her. However it’s not a demon that has taken her but the unkempt bunch of blokes who turned up unannounced in her village. 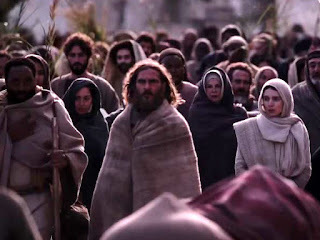 This ragamuffin group turn out to the disciples lead by a rather scruffy chap called Jesus (Joachim Phoenix). A man who seems to be keeping his alleged charisma well hidden. Nonetheless she elopes with this dozen or so blokes which perhaps understandably doesn’t go down that well with her father and brothers. 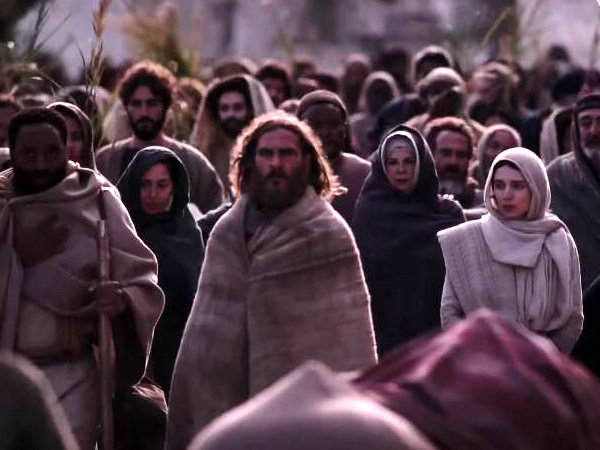 They attempts to take her back but the disciples refuse to let her go. Which I didn’t think was very Christian of them. So this retelling puts Mary M front and centre and seems to suggest that she knew what Jesus was on about better than the lads did. She becomes somewhat a teacher’s pet and starts following Jesus around like a lost sheep. Which, to be fair, is pretty much what everybody else does. The cameraman included which is why the film often drags so much. There are only so many lingering stares between the two of them you can take. Apparently Phoenix and Mara are an actual couple in real life, I just hope they have more chemistry at home and perhaps speak a bit louder to each other because at times here the dialogue is scarcely audible. There are a few other, possibly contentious and confusing, plot changes. Judas (Tahar Rahim) doesn’t seem to betray Jesus but sort of just makes a mistake and no money changes hands. While Peter (Chiwetel Ejiofor) forgets to disown Jesus, not once let alone three times. It’s all a bit of a mess really but lets face it, no one really knows what went on out there in the desert in 33AD, but if it really was as dull as this then I doubt this bible thing would have gained as much traction as it has. Afterwards we attempt to get food and a pint but everywhere seems to have shut down early because it's Easter and we end up in a fast food burrito place which isn't actually too bad before getting the train back.